Daniel and I love arguing with each other about random design questions though somehow we generally end up agreeing on what to do, without agreeing on a conclusion to the original question. The result is, at least, a practical course of action. This is the story of an argument where I concede victory to Daniel. 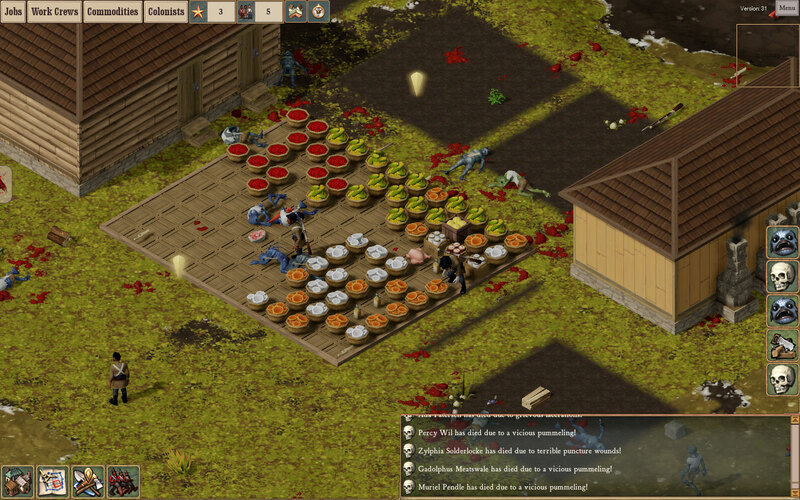 This colony was barely holding together, the only survivors are a pack of utterly depressed militia soldiers. They have only a stockpile full of raw food, their guns, and some whisky. … then thirty Fishpeople raiders attacked and it was all over. The re/set rally point is hidden deep in the UI, and requires many actions to access. Surely this can be made more accessible. Related to the above, the Work Crews list does not ‘remember’ where it was scrolled to after it was closed. The on-map rally beacon itself does not have an option to “move rally”, just “cancel job”. On the top, a top-aligned alert. On the bottom, mini alerts attached to the game log. This would mean that you have instant access to all military squads not unlike (but rather less complex) than Paradox’s concept of an “outliner” which they added to all of their immensely complex strategy games a couple years ago. The rally alerts only show up when you’ve given a direct order, so there should never be too many of them nor should they be irrelevant. The bottom mockup (shown above) even shows a concept of changing the icon based on what the squad is doing. Now … I’ll still argue that all of this isn’t a bad idea, but Daniel hit me with the observation that what I was doing was optimizing the ability of a player to micromanage rather than removing it. This violates our design principle of “set policy, not each individual order”. Because although we want to give military squads orders, we don’t want this game to be about making playing Fishpeople Whack-a-mole easier: The game shouldn’t even require the player engage in Whack-a-mole at all. Interesting. See, we had a problem, so we figured out how to make it easier for the player to solve. We should have solved the problem. 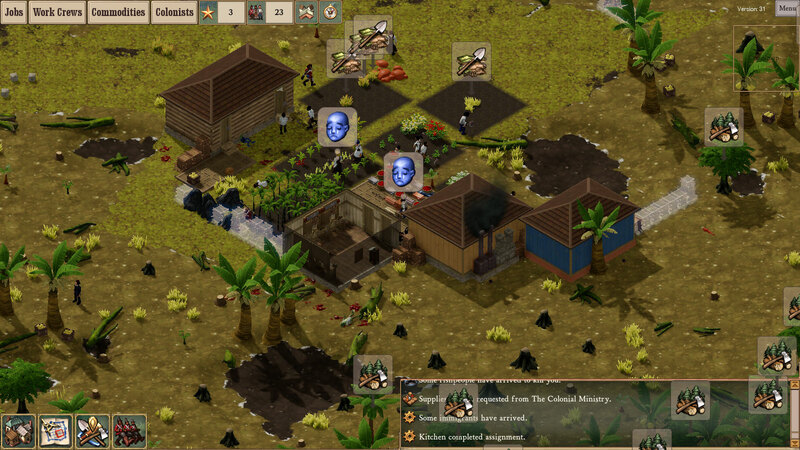 Or, if you like, we should make the colonists smart enough to solve the problem for the player. Hidden “call for help” rally-like thing is created. OR the entity will have left the area / been killed, in which case the soldier shrugs and goes back to whatever they were doing. Thus, Fishpeople whack-a-mole is dealt with automatically. And the mechanic fits very neatly into the behaviour you’d expect from simulated people! Another attempt – trying to get walls up and farms working while fending off swarms of Fishpeople. It ended in the horrible death of everyone, of course. If via testing it turns we do need the additional rally point UI with alerts and all, we can do that. But we don’t want to suggest via UI that the player must micromanage squad positioning for something as small as random Fishpeople wandering into their settlement. For more serious threats? Well, then we’ll talk. We did a bunch of these! The top two are podcasts, the bottom two are text. This will appear as revision 31A in the “experimental” version of the game which you can opt into via Steam. Posted in Clockwork Empires	| Tagged "New Sogwood" is a terrible name, basically a lot of code is being written to shout "allo allo allo" at things, Fishpeople, fixing the curry recipe was my top priority, for the last time the fishguns don't use gunpowder, I am ridiculously happy that stumps can now be cleared, the founding of new sogwood, Troy needs to study up on his Shen-Ji Yang (but we still love him), What do axe murderers talk about anyway? Oh I chopped a fellow up right good not two minutes ago and how are you? Shant people hide indoors when they come around? Or maybe they must be ordered. That’s actually a neat idea. Relates a bit to the suggestion we’ve had a few times for a kind of “town bell” you can activate to have everyone gather in the center of your town. This game has the greatest patch notes EVER. Unless I was of the stabby persuasion, I would take any and every opportunity to make myself scarce or hidden when hostily engaged. Of course even if I weren’t petrified in horror, If the thing facing me down had more of an inclination to attack based on my sudden movements, I would gradually sidle off until some other poor sap drew the attacker off with a rapid egression. It occurs to me that you might not always *want* soldiers to respond to calls for help — say, if you have a new and inexperienced militia (hello Gnomoria yes I am playing wrong I know). Might you want to provide the option to turn individual squadrons’ “respond to calls for help” property on and off, such that one squadron might be the designated Town Guard and others activated only in emergencies? Though ideally the quality of being inexperienced militia would just make them worse at responding to danger — we can, for example, track if a person is militia vs. has military training and if they have the “coward” trait. These let us sort of adjust behaviours without having to give explicit control to the player. The player should, of course, be made aware that things are happening for these reasons. That is a Horadric Lutefisk Cube from Dungeons of Dredmor.